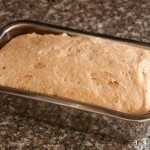 This past weekend I decided to try making bread using the Vitamix. I’ve been thinking about making bread for a long time, but I’ve always been a bit intimidated. I have zero experience with breadmaking. 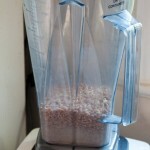 I decided to start with the simplest recipe in the Vitamix Whole Grains Cookbook. 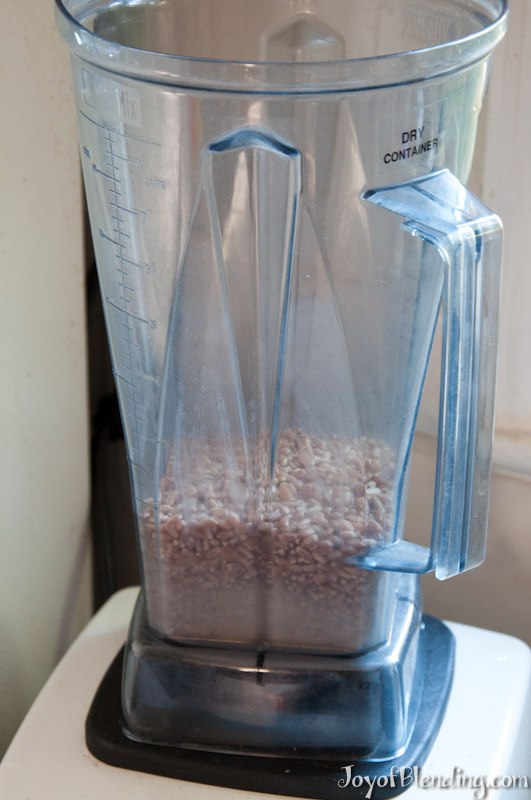 The basic premise is that you can grind the wheat berries to make whole grain flour, and then also use the Vitamix to do the mixing and kneading for you. I was very happy with how it came out, and it was very easy/straightforward. I have a container with the dry blade, which has a slightly different shape from the wet blade, allowing it to circulate dry materials better. I’ve heard that you can grind flour with a wet blade, but that it likely will not come out as fine. I’m sure there are a lot of tweaks you could make to this recipe, but it works well enough. 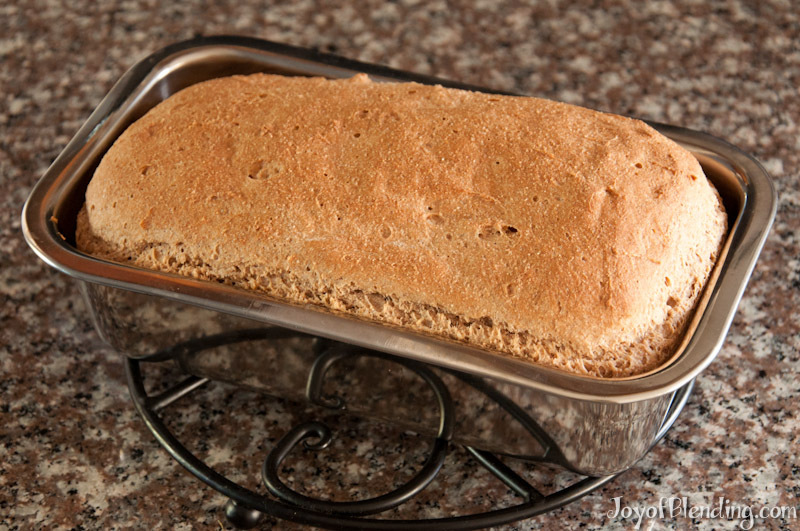 The smell of baking bread, and then having the freshly-baked bread made it seem completely worthwhile. Since I just followed the Vitamix recipe, and they conveniently have it on their webpage, I’ll link to it rather than copying the whole thing out (this recipe is identical to the one in their cookbook). You can find it here. It took me about 45 minutes to get it into the pan, but that included stopping to take pictures and reading on the internet about proofing yeast. I bet with a little practice I could do it in about 15 minutes. Then it rises for ~20 minutes, and bakes for 35. The hardest part is waiting for it to cool before eating it. 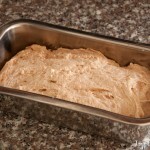 The Vitamix folks don’t comment on this, but some sources say that bread should be fully cooled before cutting into it. That said, it was too hard to resist, so we cut into it while it was still warm. I can’t comment on shelf life because we finished it the next day. Update: This goes great with a Vitamix soup. Lately I’ve started playing around with making it into some simple croutons. I followed a Bittman technique from How to Cook Everything Vegetarian: cut bread into cubes and bake at 400 °F for 15 minutes, then shake/turn and bake for another 5-15 minutes. Update 2: I’ve started making a sourdough rye version of this bread. 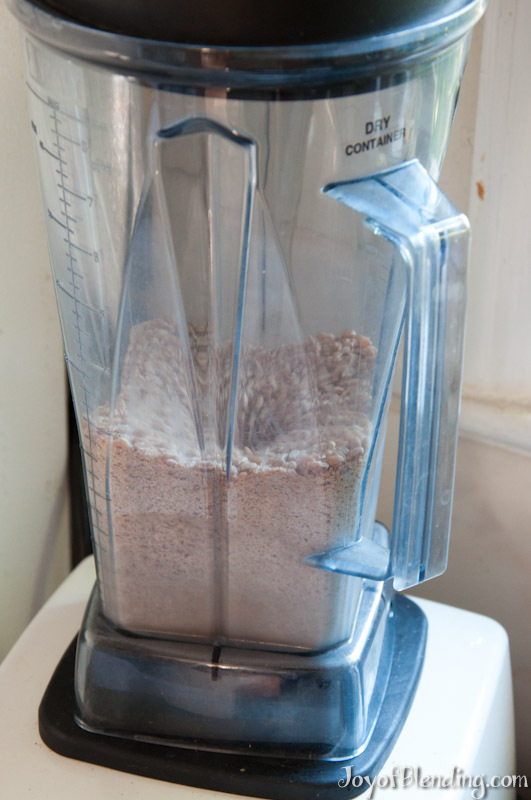 I love the Vitamix grain grinder. This also works perfectly for quick-rise breads like muffins and especially pancakes; with a dry container, grind the wheat berries (1.75 cups) until fine and add the salt (1 t.) and baking powder (1 T.) and blend thoroughly. Then add the liquid ingredients (about 2 cups; I use 2 T. yogurt and water for the remainder) and whiz until frothy. (I skip adding oil or butter to the mix because the berries contain plenty of wheat germ oil.) Finally stir in blueberries, nuts, etc. Pour onto a hot griddle. Yes, Vitamix pancakes are awesome! They are even easier/faster than bread. I plan to blog about them in the future (unfortunately I currently lack a good griddle for cooking them). Back when I was making them regularly I liked to use buttermilk, but I may have to try your suggestion of yogurt. 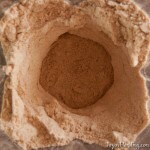 OK, I finally made (and blogged) Vitamix pancakes! After grinding the berries, are you switching to the wet container or continue using the dry container? I always continue to use the dry container. This bread is ridiculously good. I devoured almost half a loaf in one sitting. Goes beautifully with herbed olive oil, butter, or–my favorite–the strawberry preserves I picked up at Scream Sorbet in Oakland: http://www.screamsorbet.com/. I tried to make this bread today and had two issues. The Vitamix must have overheated when I was doing the “Step 2: With the switch on High, quickly turn the machine on and off five times.” They say to do this 5 times. Is 25 times too much? Thankfully the Vitamix shut off on the last round. Then it didn’t rise very much in the loaf pan so I just baked it. I let it rise for 30 min instead of 20 min as it mentioned. It has a good taste but is obviously dense since it didn’t rise that much. Any thoughts on what I did wrong? Or does anyone just knead the dough by hand instead of turning the Vitamix on/off 25 times? I’m sorry to hear that your machine tripped its thermal overload switch. I haven’t had my machine overheat yet. Yes, when I make it I pulse it the 5 groups of 5 times, and I’ve never hand-kneaded it. In the times I’ve made this bread my biggest failure was one time when I let it rise too long. I had delayed in preheating the oven, so the oven wasn’t ready. The dough kept rising and then it collapsed soon after I put it in the oven, so I ended up with a dense loaf. Still perfectly edible though. Thanks for the note. I have the 6300 model and made it in the wet container (I don’t have the dry). When I pulsed, maybe I had it on too long (not an instant but just 1-2 seconds). Maybe that made the difference? I scraped down the sides in between each group of pulses. Also, note that the rising time depends on temperature–if it’s in a cold room it will take longer. I suspect that the extent with which you “proof the yeast” may also feed into rising time. And finally, whole wheat is known for being slightly trickier to get to rise than white flour. Good luck with your next loaf! We’re on our 3rd loaf today. We are finding it’s not rising much for us. The first 2 loaves collapsed and the third is not rising much. We’re new to the Vitamix, but we are using the Dry Container. I’m not sure what to recommend. Are you using a hard wheat? You can look at the photos in this post to get an idea of how much mine rose. This sounds amazing and I want to try it this weekend. Were your wheatberries frozen when you put them in the dry mix container and where did you buy them? I live in a town with a small selection of good markets for these kind of things. Yes, I started with frozen wheat berries, although that is not necessary. I buy mine at a local grocery store that has an extensive bulk section. They may also be in the packaged dry goods section of the grocery store. If your grocery store does not have them, you could also look in a health food store. Alternatively, you could buy them online. Just remember that you want hard wheat berries for bread. Adam, made my first loaf yesterday and it turned out amazing and looked beautiful as I smoothed the top with a wet spatula before rising process. Now I am interested in adding “other things” to it. Any comments on other kinds of grains perhaps a lighter wheat berrie, oats raisins etc AND proportions would be great! Thank you again for this amazing site. Am going to try your pancakes this weekend. That’s great that your loaf turned out well. I haven’t played around with other additions, but I’m sure you could add various things. I’ve recently started experimenting with sourdough myself. 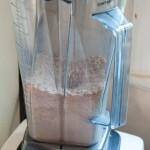 has anyone made the oat bran bread featured in the Vitamix whole grains cookbook? Interestingly, it increases the flour by 2 1/4 cups, but does not increase the liquid over what was listed in the whole wheat loaf. I want to make it today using fresh oat bran, but afraid it will be super dry. Please help if you have made this recipe. I looked on-line and it is not listed on the Vitamix site, but is in their cookbook. Made my first loaf today, using duram wheat my friend brought straight from her farm. I too had a rising problem, wondering did you guys use quick rising or regular yeast? Durum wheat . . . is unusual in that, despite very high protein content, it is low in desirable gluten needed to form a glutinous web necessary for bread to rise. As a result, although 100% durum wheat breads do exist, . . . in most instances bread doughs contain only a portion of durum wheat and are supplemented substantially with commercial white flours, oftentimes those higher in gluten necessary to offset the poor gluten contribution of durum flour. When durum flour is used as the sole flour in bread, substantial additions of isolated wheat gluten are necessary to effect rising. 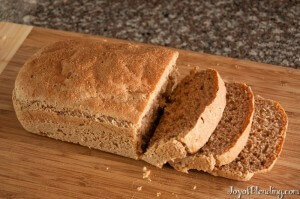 Without it, 100% durum wheat breads are often heavy, with very close grain, and will split easily when risen for baking. When I’ve made this recipe I’ve always used hard red winter wheat, which has a higher gluten content. 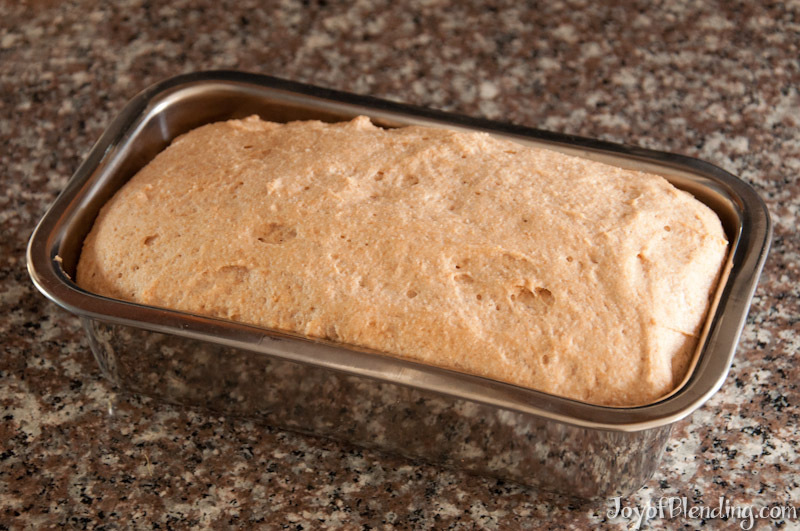 The yeast is “regular” active dry yeast (not quick). I’d say that the result is still a little dense, but it does rise as you can see in my photos. I came back here after trying my second loaf. Guess I will keep the Durham wheat for he jalapeño corn bread , and I will try to find other wheat berries somewhere in my city! Deb, I did used red winter wheat that had been in the freezer for a day or so (recommended in the Vitamix Cookbook). Additionally, when I made this bread I did proof my regular (not fast rise) yeast first although I have never done that in the past when I made bread prior to my Vitamix. My loaf did “double” in size, but did not rise up and out of the pan. I did smooth the top with a wet spatula, and brushed it with egg white just before baking. I have been experimenting with adding other things and last week added shredded carrots and parmesan cheese. (add during the kneading portion through the hole in the top) and this week am adding a little dill at the same time I add the carrots and cheese. 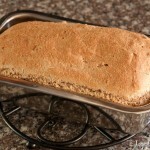 I love this bread recipe and it is so easy in the Vitamix. Good luck and I think Adam’s technical advise might explain what happened to your loaf. Hi Deb, I just bought a pasta maker and understand durum wheat is good for pasta (due to the low gluten content). I was wondering how the constistency of the grind was for the durum in the vitamix. I don’t want to buy pounds of durum if it doesn’t grind finely for pasta. Thanks! and I’m looking forward to making breads and the above-mentioned pancakes in my dry blade vitamix too! The flour ground quite fine, although admittedly this is the only wheat I have tried so far, so I don’t have a visual comparison. I am having difficulty getting my bread to look/feel elastic. 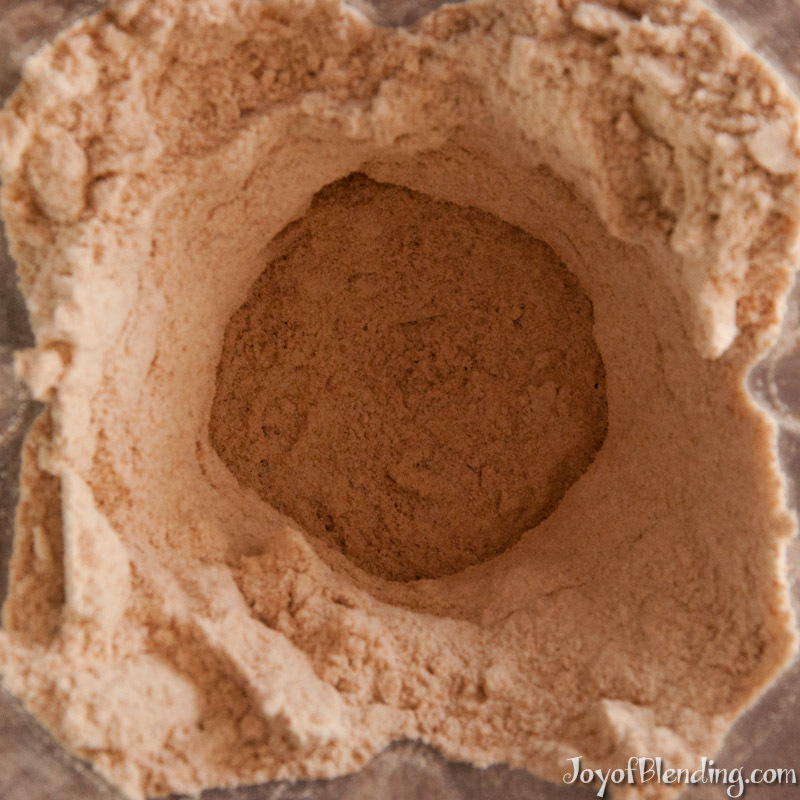 I am using hard red wheat and a mix of white and red wheat. It seems like a thick paste (like nut butter) to me. I am using the recipe in the cook book. What tips do you have for me? I’ve switched over to making a no-knead sourdough (https://joyofblending.com/no-knead-sourdough-rye/) so it’s been a long time since I made this recipe. My first thought is to try using hard wheat only—that should help with the structure. Also, are you using the dry blade container? It should do a better job of kneading than the wet blade. I just made this using the recipe in the book, and had the same problem; it ends up the website recipe has a quite different amount of wheat called for (350g) v.s. the book’s 270g, with the remaining ingredients about the same. So I think the book is just wrong. Thanks for the inspiration! 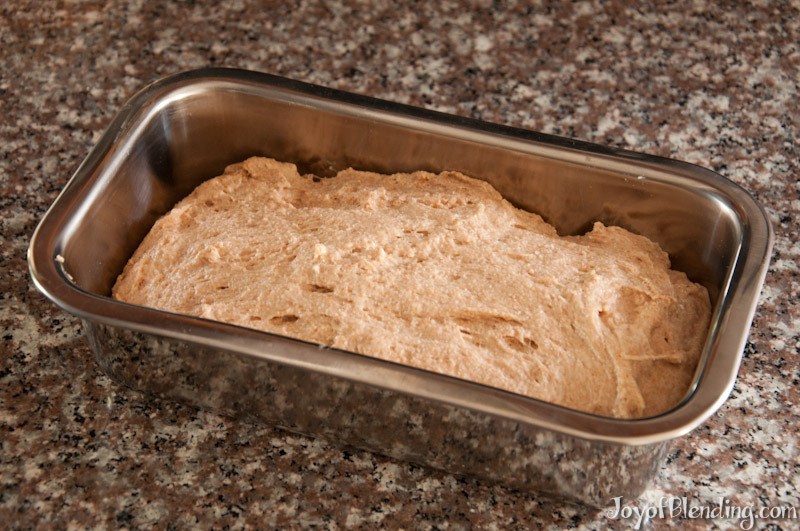 Mine is in the oven now…looking forward to trying it! One thing I noticed so far – when I brushed the top of my dough with the egg wash, it deflated the roundness of the risen dough. Did I put on too much egg wash? Do you suppose if I purchase the dry blade, I’ll be able to make this recipe in my Vitamix50S? The dry blade is not compatible with the Vitamix S50. You could try this recipe in the S50’s 40-oz container, but I’m not sure how well it will work. Don’t know if you realize it or not, but the bread recipe you link goes to a page that says , “Sorry, but the page is not found.” Is that recipe still available somewhere? Thanks for pointing that out! 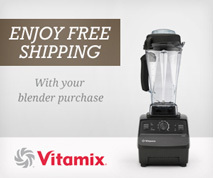 Vitamix changed their URL structure without properly implementing redirects. I just updated the link, so it should work now.